Da Capo Lifelong Books, 9781600940491, 320pp. Vegan chef Isa Chandra Moskowitz shares her collection of plant-based and low-calorie meals that are full of flavor and totally satisfying. You'll also find lots of gluten-free and soy-free options. The best part? Dinner can be on the table in less than 30 minutes. So ditch those diet shakes. Skip that lemonade cleanse. And fight for your right to eat something satisfying! Now you can look better, feel better, and have more energy while eating the food (and portions) you deserve. "[A] great read!...Moskowitz-a tireless crusader against the perception that meatless, dairy-free meals taste like cardboard-proves low-fat can be delicious. While offering plenty of tips for novice vegans, Moskowitz's recipes are interesting and flavorful enough to delight seasoned meatless mavens, too." "Surprisingly creamy and hearty, this vegan soup [Cauliflower Pesto Soup] is elegant enough to serve as a first course at any dinner party." "Moskowitz has singlehandedly revolutionized vegan cooking...Appetite is brimming not only with recipes, but also detailed nutritional information useful to everyone, but especially important to those who seek essential vitamins and nutrients from nontraditional (non-animal) sources. But if you're worried about typical bland diet food, have no fear: This is an Isa Chandra Moskowitz cookbook after all. While all recipes are between 200 and 400 calories per serving, each is loaded with delicious, vibrant flavor." "A snappy cookbook that embraces whole plant foods without a sugary snack in sight. Those avoiding gluten or soy will appreciate the numerous gluten-free and soy-free recipes, and everyone is sure to learn something from the preparation and nutrition tips [Moskowitz] sprinkles throughout the book. Best of all, her recipes for goodies such as OMG Oven-Banked Onion Rings, Tamarind BBQ Tempeh & Sweet Potatoes, and Chipotle Lentil Burgers will make even dedicated carnivores appreciate the pleasures of plant-based meals." "Moskowitz is a proven advisor you want to have in the vegan kitchen with you, consistently creating recipes that are at once accessible to the home cook and impressive enough to show off to those you want to, well, impress. Appetite for Reduction...will knock your socks off, just in time for a great Christmas gift for omnivores or vegans alike and strengthen some of those New Year's resolutions...Easy-to-follow directions, well-organized chapters, [and] gorgeous art direction and helpful tips...The icons that designate quick-to-prepare, gluten- and soy-free recipes make this cookbook especially user-friendly...Appetite for Reduction casts its culinary net wide...The recipes span the globe and include rare treats calorie-conscious diners usually don't get to enjoy...Appetite for Reduction gives lots of creative, easy and tasty opportunities to eat healthfully...A very worthwhile edition to anyone's cookbook collection." "Moskowitz is one of the most-prolific and readable vegan cookbook authors out there. She co-authored Veganomicon, which is practically the Bible for newbie vegan cooks, and her other titles have shown how vegan cookies, cupcakes and breakfast treats can be decadent and rich." "Shows that healthy cooking can be lively and varied...Any vegan cook needs this inspiring, unique title." "If you're not vegan, but simply don't like meat very much, you'll find many tasty recipes here." "For those in the vegan community who are also health conscious, Moskowitz has delivered the goods on a plate too irresistible to deny. Isa Chandra Moskowitz is the best friend we're all looking for: she writes in a way we understand, a language that is easily understood and humorous. She is also the cook we want for our healthy lives and families. She gets it. She gets that we don't want to give up taste and satisfaction for healthy living...From funky hummus creative ideas to 'OMG Oven-Baked Onion Rings,' from sides to satisfying full entrée ideas, Moskowitz turns your vegan kitchen upside down, shakes out the fat, and replaces it with novel and tasty ideas to keep your mind interested and your tongue happy you tried something new...Vegan or omnivore, you will find something to rave about and savor in Appetite for Reduction." "Appetite for Reduction not only provides extremely diverse and relatively easy recipes using a huge range of plant-based food; it is an enlightening, entertaining must-have cookbook for vegans, experimental vegans, and even the carnivore chef. Highly Recommended." "From the grand dame of vegan cookbooks, Appetite doesn't leave you hungry...From salads that satisfy like meals to hearty pasta dishes to every vegetable imaginable, Appetite doesn't miss a beat...Unlike other diet books, Appetite isn't about dropping 20 pounds in a weekend; it's about eating healthfully in a way that can lead to weight loss without resorting to drastic measures-measures which Moskowitz assures are guaranteed to pile pounds right back on." "I recommend this cookbook for anyone, vegan or not...[Moskowitz] has put together 125 recipes that are under 400 calories-perfect for that New Year's resolution to lose weight-and are packed with nutrients-perfect for that New Year's resolution to eat healthier." "Moskowitz is an innovative source of vegan recipes...Appetite for Reduction offers tempting recipes that are quick and easy, and-most importantly-no- or low-fat...Moskowitz has lots of yummy ideas that prove that dieting doesn't have to be painful...Moskowitz incorporates the reduction of unhealthy foods, environmental impact, grocery store costs, and animal suffering in her cooking philosophy. The results are tasty dishes with no guilt attached." "Contains 125 fabulous recipes that are quick to make and most take 30 minutes or less to prepare. These tasty dishes are easy on the budget and are made with real food for real people. Nothing bizarre, no outlandish over the top ingredients, just good for ya, low fat, delish vegan food! Oh and the portions are real, too! None of these ridiculous tiny serving sizes to get the low calorie counts. These are real servings folks!" "[Moskowitz's] latest cookbook could be one of her greatest yet...Anyone who has already inhaled a lifetime's worth of vegan sweets and processed foods, or who is interested in the vegan diet for health reasons, will probably love Appetite for Reduction." "If you're suffering through the fourth day of some weird diet, you might want to pick up a copy of this book and make yourself something good to eat." "Jam-packed with mouth-watering vegan recipes that are low in fat and light on calories...[Moskowitz's] recipes are visual and gastronomic delights, which inspire the reader to try new things and cook outside of their comfort zone, while never underestimating the beauty of the familiar." "This new book...is a winner for losers-weight losers, that is...Moskowitz offers delicious dishes that fill you up...There's no scrimping on nutrients or culinary creativity...Welcome to low-fat meals that are satisfying and mouthwatering, too." "Appetite for Reduction blows the idea of bland salads out of the water...[Moskowitz's] recipes are inviting [and] sound delicious...[Her] directions are so easy to follow and she gives great food handling tips along the way." "This book is for anyone whose philosophy is that dieting shouldn't mean restricting yourself to eating small portions of bland vegetables, side salads or relying on diet shakes...Isa shows that, with the right ideas and inspiration, diet food can be quick, imaginative and tasty." 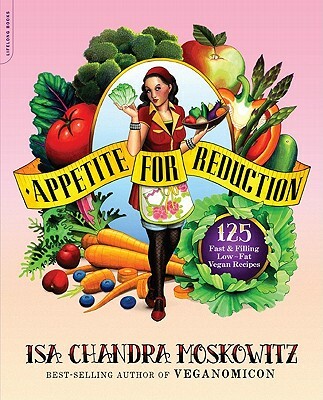 "Queen Vegan Bee Isa Chandra Moskowitz...is pretty much the best and her new book, Appetite for Reduction, is truly excellent." "Isa Chandra Moskowitz is a rock star in the vegan world...and has co-authored and authored five books on the subject, including the definitive roundup Veganomicon. This Saturday she'll discuss her brand new, equally groundbreaking cookbook Appetite for Reduction." "If you're aiming to lose weight, or just eat healthily, but still enjoy food, this is the book for you." "Hearty, low-fat vegan fare is complemented by a veteran cookbook author's considerable gift for gab in this winning collection...With this selection in hand, serious cooks with high standards can feel confident inviting over their finicky foodie friends." "Bursting with inventive, flavorful techniques for lightening up comfort-food favorites and for making plants pop in new and exciting ways." "The perfect book for that picky vegetarian who is determined to eat healthy and maybe even lose some weight." "[This book] won't appeal only to people who don't eat animal products...[Moskowitz's] ingredients are fresh, but they're also accessible: veggies, common spices, beans and rice are frequently used here. As an added bonus, the lack of meat and processed meat and dairy alternatives makes most of this book great for chefs on a budget. And most importantly, this food is tasty." "As with previous Moskowitz books, one thing not sacrificed is flavor. She plays with Asian, Mediterranean, Indian and Latin cuisine with her recipes in ways that make you feel like you're not losing taste by cutting out fat." "Appetite for Reduction is all about real food for real people, really easily...What's not to like?...Spend a lot of time eating from the recipes in this book and you will get smaller." "Contains 125 delectable, nutritionally-balanced recipes for the foods you crave-lasagna, tacos, barbecue, curries, stews, and much more-and it's all only 200 to 400 calories per serving, plant-based and packed with nutrients, low in saturated fat and sugar; high in fiber and, well, delicious." "Moskowitz is the best and most creative of all the chefs working with plant based foods...This is not your mother's low-fat cookbook." "Moskowitz's 125 vegan recipes are nutritious and fun to cook." "Appetite for Reduction features conversational language, side bar tips (cooking/shopping/basic food information), nutritional guides, nutritional tips and simple yet tasty recipes."